If I say, picking the best but cheap WordPress hosting isn’t that difficult as some users think, you might say it's not that simple and easy as there are numerous host that claims to offer quality services at affordable prices. You are quite right, but this article will help you find the cheap hosting for WordPress in next few minutes to build a business website or blog. Gone are the days when creating a site was expensive, but nowadays you can set up a blog within $2 to $8/mo including a free domain name. Most of the providers out there offer a special discount to new users for the very first purchase. It not only help companies to attract more customers but also enables you to save few bucks. You can buy a monthly hosting plan which usually costs $10 per month (without promotional price though) just at $2.99 per month as a new client. Isn't it a big saving? Here also keep in mind that at the time of renewal, you will have to pay standard fees which cost more than the first payment. You can overcome from this situation by switching to other company. It saves you a lot of money. The new host will offer you biggest discount because you’re a new customer to them. It’s a quick tip to save some bucks, but I have compiled a list of inexpensive WordPress hosting providers. You can get a massive discount and promo offers from below mentioned low-cost hosting companies. Along with low-cost hosting plans, they give outstanding services such as server uptime, speed, reliability, 24/7 customer support, and much more. InMotionHosting is one of the cheap hosts to get SSD powered web hosting with advanced features such SSH access, Max speed zone, WP-CLI, and safe application roll-back. They are CNET certified hosting company and due to outstanding performance have got 3 out of 3 rating as well as A+ BBB rating which ultimately urges to give this hosting provider at least one try. Why I mentioned InMotion at first place? Well, it allows you host multiple websites even in the very first plan “Launch” which comes with unlimited storage, bandwidth, email accounts, and a FREE domain name. But, you can create the maximum two databases which mean you can install two CMS based websites or platforms which require the database. On top of that, all of their shared plans included solid state based storage, free data backups, free website migration, website builder, free SSL certificate, and Max speed zones to enhance site speed for better search engine visibility and user experience. For advertising your newly created website, they give you a gift of $250 worth credits in Bing, Google, Yahoo, and YP.com listing. When we talk about the support services, they offer customer support via multiple methods including live chat, ticket, and phone call 24/7. After experiencing InMotion support, all I can say is they talk roughly 2~5 minutes to reply which is acceptable. You get an insanely long 90-day money back guarantee period which clearly shows that the company is highly confident about their service quality. BlueHost is a well reputed web hosting company that is also known as the 20 world's largest hosts. Matt Heaton founded it in 1996. Endurance International Group acquired BlueHost in 2010. BlueHost claims to provide fastest hosting with 99.9% uptime at very reasonable price of just $3.95/month. They have data centers located in Utah, USA. Right now they are managing over 2+ million websites and domain names on their platform. BlueHost is officially recommended by WordPress.org to start a blog and mention on their official page here. They offer different types of packages such as Cloud, Shared, VPS, Dedicated server, Managed WooCommerce and managed WP hosting. When you buy any hosting package, you get a free domain name for one year and a drag & drop site builder. Some extra features also include like Spam experts, SSL certificate, Dedicated IP, Domain privacy, and Site Backup PRO in shared business plan. You get an enhanced control panel (cPanel) with built-in functions that make it much easier to maintain WP websites like creating backups, traffic statistics, file manager, enabling SSL, etc. One of the great features is built-in option to enable CloudFlare CDN within one-click to enhance the site performance and loading speed. cPanel also gives you the capabilities to access log files, database, email, .htaccess file, and SSH(Secure Shell) commands. 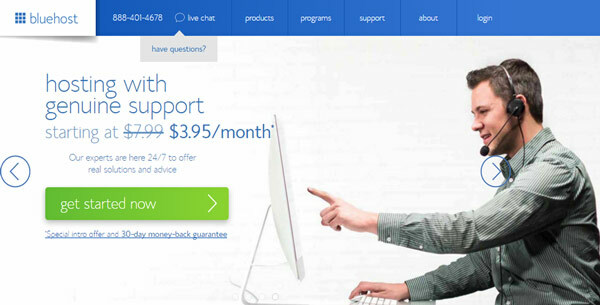 BlueHost has 24/7/365 technical support via live chat, ticketing system as well as phone call. Their cutting edge technology and advanced hosting servers are quite fast and provide 99.99% uptime. 30 day money back guarantee is another reason to buy web hosting from BlueHost. You can request the refund within with whole month if found them worthless which doesn't happen in most of the cases. SiteGround is a privately-owned inexpensive WordPress host, founded by a few university friends in 2004. In 2007 and 2008, SiteGround was selected by Best Host Directory as a “Best WordPress Web Hosting Company“. Currently, they are serving over 500,000 domain names on their platform. SiteGround has data centers in 4 countries: US, UK, Netherlands, and Singapore. They developed custom designed software for monitoring, isolation and speed optimization of hosting servers. You can buy Shared, Cloud, Reseller, Dedicated or managed WP hosting plans at good rates. Even, they also offer special packages for students Skadate, and WP eCommerce website. Hosting plans are based on a limited number of monthly unique visitors, but bandwidth is unlimited. All the plans cover following benefits CloudFlare CDN, Free SSL, Email accounts, Website migration, Daily backup and drag and drop website builder. When it comes to SiteGround, the core purpose is offering outstanding hosting experience with reliability to make every single site loads fast. The sustainable servers deliver 99.99% uptime which never let down your business/blog for a second. They use Solid State Drive and NGINX server technology to provide 4x speedy hosting. SSD drives and NGINX are included in all shared and cloud plans however NGINX is also available for dedicated plans. The most impressive features I like about SiteGround is In-Hosue built Geeky SuperCacher system which incredibly improves your site loading time. It is a caching mechanism based on NGINX reverse proxy that speeds up the transfer(Input & Output) of the site content. SiteGround claims 24/7 and 365 days technical support via Live Chat, Ticketing system, and Phone call. Though all the features and benefits of SiteGround looks great, but if it failed to deliver what they claim then you can refund your money within 30 days. A2 Hosting was founded in 2003 to provide developers-friendly and features-rich web hosting. It is Ann Arbor-based web hosting company offers shared, VPS, reseller, dedicated, and cloud hosting as well as domain name registration at the affordable prices. It is an excellent cheap WordPress hosting to avail SSD storage for the fastest loading time. Their hosting plans are affordable and come with dozens of features to run new or old websites smoothly. All the hosting plans comes with SSD’s and thus offer 20x fast site's loading time. You can purchase the very basic hosting plan just at $3.92 per month for one year subscription to host one website. I have been testing their services for the last couple of months; they are just awesome, fast and stable. Their swift servers are capable enough to deliver an incredible 99.99% service uptime. Plus, their "Turbo Boost" feature makes your website fast and reduce the loading time drastically. You can also utilize A2Optimizer to enhance overall loading speed. A2 Hosting provide you a standard control panel (cPanel) to manage your hosting account. Each account also includes free SSL certificates, free site migration, unlimited storage and bandwidth, and 24/7 Guru customer support via live chat, phone, support email, and Skype. They also have a well-managed knowledge base where you can find instant solutions. So, are they offer money back guarantee? Well, yes. A2 Hosting have anytime refund policy in which you get full return within 30 days and after that pro-rated refund for unused services. 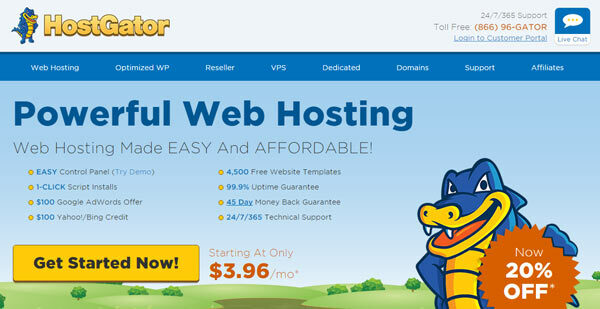 HostGator, known as the largest hosting company that has hosted over 8 million websites. It was founded in 2002 by Brent Oxley, who was a student at Florida Atlantic University. Endurance International Group also owns it. HostGator has owned two data center one located in Houston, TX and the other one in Provo, UT. They use latest and enhanced technologies to provide the reliable, fast and superior performance to customers. HostGator offers shared, VPS, dedicated, managed WordPress, Windows, and cloud hosting with 99.9% server uptime. Almost all the plans include Unlimited bandwidth, storage, Sub domains, FTP accounts, and email accounts. They provide one-click CMS(Content Management System) install feature and over 52+ free CMS scripts. Like other WordPress web hosting companies, HostGator also offers free drag and drop site building tool and thousands of free website templates. Plus, HostGator provides free transfers for new accounts within 30 days of sign-up, and to newly upgraded accounts. The control panel (cPanel) comes with features such as website statistics, AWStats, Webalizer, Log Manager, and Error logs. To increase security measures, you can use hot linking, directories password protection, custom error pages, and email blacklisting feature. HostGator offers 24/7 technical support via phone call, live chat as well as the ticket system. There are over 500+ video tutorials and 680+ helpful articles available for customers/users. Regarding money back guarantee, you can try their service for 45 days and ask for the refund within this period. My Experience: I am using HostGator for some of my websites and the uptime so far is 99.9%. NameCheap is the cheapest hosting for WordPress CMS listed here, it offers reliable packages for small to medium websites at reasonable prices. Richard Kirkendall founded NameCheap in 2000, and it’s an ICANN accredited domain name provider as well as web hosting service. NameCheap’s headquarters are located in Los Angeles, California. It has made significant progress in the past as a best domain registrar and claims managing more than 3 million domains. That’s why NameCheap win the poll of “Best Domain Registrar” based on real customers votes in most popular website “LifeHacker” in 2010, and they are still at the top of that poll. It is few of those web hosting companies who accept Bitcoins for payment process along with MasterCard, Visa Card and Paypal. In my experience, it’s a great place for buying domain names at low prices, but hosting plans are also way cheaper than domain registration. They provide shared, VPS, re-seller, dedicated hosting as well as private email hosting. All the web hosting plans support unlimited bandwidth and multiple domain hosting. Their SSD powered servers (Solid State Drive) supercharge your site speed and loads it within a blink. One year Free WhoIs Guard with every domain name purchase could entice anyone to go with this company. 24/7/365 days technical support via live chat, ticketing system, help desk and through email is another sign which shows the company quality, credibility, and sustainability. They claimed 100% server uptime for shared hosting plans along with 14-Days money back guarantee. But dedicated plans and add-on products (such as licenses, dedicated IPs, server management, etc.) are non-refundable. GreenGeeks was founded by Trey Gardner in 2008 with the aim to provide reliable web space at low prices. In the past 8 years, the company has made significant progress and hosted over 300000+ websites. They have multiple data centers across the globe to serve high performance and fastest hosting solution. Data centers located in Chicago and Phoenix in the US, and third in Toronto, CA. You can avail any type of web hosting such as shared, VPS, reseller, and dedicated web hosting. All the hosting plans including unlimited bandwidth, data transfer, space and unlimited domain to host on a single account. Free website migration and free domain registration also included in hosting plans. You can create unlimited secure IMAP and POP3 e-mail accounts which can be accessible via web mail or through your favorite e-mail client like outlook. Their enhanced control panel helps you manage websites using features such as file manager, phpMyAdmin, traffic statistics, backups, bandwidth monitor, and much more. The cPanel support 150+ scripts and Google apps integration with one-click installation feature. They also offer SSH access so you can access your files and data securely. Even you can modify permissions, edit files directly on the server, configure and can install your scripts directly. GeenGeeks provide 24/7 customer support via live chat, phone call, and through the ticketing system. They guaranteed 99.9% server uptime and fastest servers performance along with 30-Days money back guarantee. iPage is another budget friendly hosting company owned by Endurance International Group. Thomas Gorny funded it in 1998 as a full web services provider. But in 2009, it was re-launched as a hosting company. In the past 18 years, iPage has hosted over one million websites on their servers. It is also a domain registra﻿r that provides over 321 domain extensions for registration. iPage has owned two data centers, located in Boston, MA area. The organization claims that they use 100% wind energy to manage servers. iPage offers shared, VPS, managed WordPress and dedicated web hostings. All the plans contain unlimited bandwidth, storage, email account, and free domain registration. You can host unlimited domains on one account without any limits. Besides, they also offer hundreds of free mobile-friendly themes, site building tools, and 1 GB cloud storage account. Regarding email sending and receiving, webmail account comes with spam filters, auto forwarder, and virus checker feature. Starting an eCommerce website or online store isn’t complicated with iPage as they offer all types of tools that are required to launched an online store. Shopping cart and PayPal integrations come built-in so you can add online payment option along with SSL Certificates to make transactions secure. It also offers easy to use control panel which helps you monitor site traffic statistics and other management options. They have 24/7 customer support via live chat, phone, and email system to help you whenever you need them. They claim to provide excellent service and 99.9% uptime but in my experience, there are some downtimes happen time to time. If iPage failed to satisfy you, then refund within 30-Days (money back guarantee) no questions. Include all above benefits; I can say anyone can easily buy their plans and within $36, you get a FREE domain name and hosting plan for one year. 1and1 can be the perfect cheap hosting for budget conscious users, it’s owned by a German company “United Internet.” Ralph Dommermuth founded it in 1988. The company has two data centers, in Europe and Lenexa, Kansas. 1and1 is the cheapest domain registrar that provide domains just at $0.99 per year to new customers. Free brand email address and Whois Guard is another bonus. They offer shared web hosting (Linux and Windows platforms), VPS, managed WordPress, dedicated, and cloud servers hosting. All the plans include unlimited bandwidth and storage, free domain name, SSL Certificate and drag & drop site builder tool. Other features are CDN integration, Site locker, expert support, and more than 120 one-click scripts to install any CMS within minutes. It is also the best place to start an online store because of the availability of eCommerce software such as store builder, image editor, and hundreds of website templates. 1and1 offers 24/7/365 customer support by experts via phone call and email. You must start your site with them to get 100% server uptime, fastest site loading speed with SSD technology. 30 days money back guarantee is another impressive feature to protect your investment. InterServer was founded by two high school students Mike Lavrik & John Quaglieri in 1999. In the beginning, the company was launch as a virtual hosting provider. In 2015, InterServer owned two data centers in Secaucus and New Jersey. Now they also provide shared, VPS, dedicated, reseller, and cloud hosting plans. InterServer is the best place to buy cheap hosting for WordPress, as it offers $0.01 (special offer)for the first month to try them. You can buy a domain with the purchase of hosting package just at $1.99. All the plans come with unlimited space, bandwidth, Mysql, and email accounts. Want to change your current host? Don’t worry; InterServer migrates your website from the old host to their servers without charging any extra fees. One best thing about this host is it uses SSD (Solid State Drive) to store web data and MySQL database for the sake of high speed performance. The control panel is traditional and user friendly, so newbies can easily handle it. In Windows plans, they offer Plesk control panel and the latest version of cPanel in other plans. Technical support is imperative to run a smooth and profitable hosting business, just like other hosts, InterServer also has a 24/7 technical support option via live chat, phone, ticket system and help desk. They claim 99.9% server uptime and reliability of service. Another best thing about InterServer is its price-lock policy. Its means the price you sign up at will remain the same at renewal time. 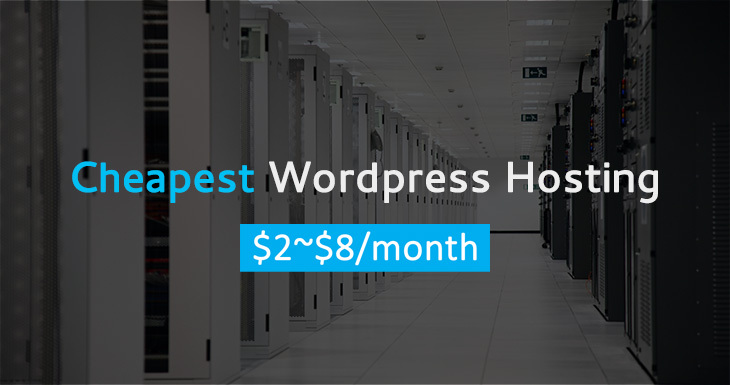 So, this is the list of affordable WordPress hosts to get hosting from $2 to $8 per month. Some hosts even offer under $2/month with free domain name when you choose yearly plan. Choosing the right company is a crucial part to build an online business or blog readership. In lowest priced hosting, chances are you and your blog readers will face downtimes, slow site speed, and other technical issues. Almost all companies mentioned above offer outstanding features, maximum server uptime, blazingly fast hosting and server security at the low price. I recommend using GreenGeeks and SiteGround as they offer stable servers, 99.9% uptime, speedy site loading and much more. Now, it’s your turn. Choose wisely from above cheap WordPress hosting services that fulfills your requirement.